The Vortex-Pro VX55 4WD is a cut above the rest, engineered to provide the ultimate pool cleaning experience. The Zodiac VX55 4WD is equipped with the best technology the industry has to over, making pool cleaning easier, ultra-efficient and fun! NEW Cable Tangling Prevention Technology - The 21m floating cable with swivel now features Cable Tangling Resistant Technology. Waterproof Kinetic Remote - Take control of the Zodiac VX55 4WD with the super responsive kinetic remote. The remote lets you drive the cleaner to where you want it to go, is waterproof and it floats. Patented Vortex Vacuum Technology - Vortex Technology provides powerful and constant cyclonic suction. This allows the Vortex-Pro Robotic Pool Cleaner to capture large debris such as gum nuts, twigs and eucalyptus leaves whilst not losing suction power. 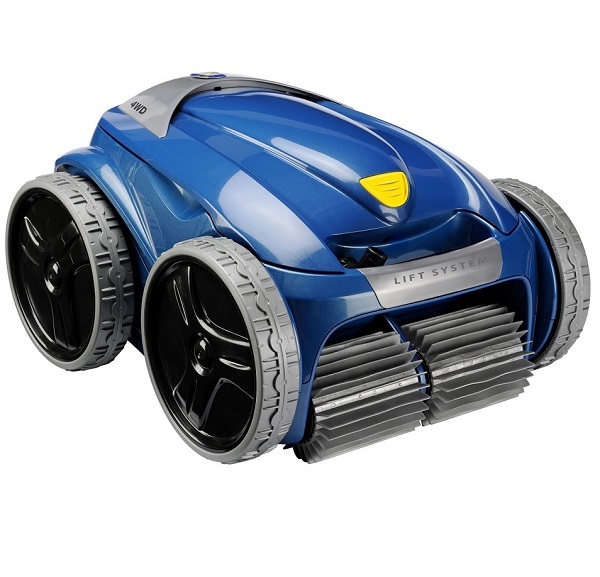 Vortex-Pro 4 Wheel Drive - Thanks to its 4-wheel automotive drive system, this robotic pool cleaner overcomes all obstacles with an amazing agility making sure all areas of your pool, such as floor, walls, steps and waterline are all perfectly cleaned. Patented Lift System - Enjoy easier removal of the cleaner with 20% less effort. eBox - The improved electronic control box, or eBox, makes it easy to operate the cleaner at the touch of a button. The eBox allows you to program the cleaner to run each day for up to 7 days when you go away on holiday. It indicates when the filter canister is full and also allows you to activate the patented Lift System. Large easy to clean filter canister - Never touch debris again thanks to the easy access and hygienic design of the filter canister. Clean and remove debris in a matter of minutes with minimum fuss. Extra large suction mouth and brushes - The new Contact+ brushes and large opening mouth underneath adapt to all kinds of debris for deep cleaning of floor, walls and waterline.